I have this problem with my site that I'm building. Specifically, I would like to display only the product categories and not the products per se on my initial product category view. Can this be done through the CMS or do I need to do some coding? OK, the configuration options in 3.2.2 are different form older versions. 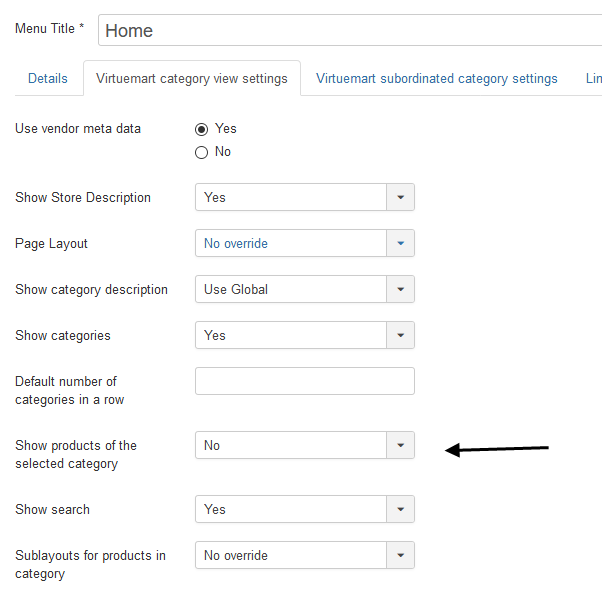 There is an option "Show products of the selected category" in VM Configuation/Templates, on the settings tabs in the Joomla menu config for the store and on the Product Category Form for each individual category. In addition display can be changed by the use of template overrides. Plenty of options to choose from! I tried these options ('Show products for related categories') and they do work for the various categories pages. What about though the root product category page? I still get a list of all my products regardless of category. ON my sites I usually I don't show any products on the homepage except for featured & latest. The image shows the settings used for the menu item. This is using the default VM templates, no overrides. Your reply and associated image were very helpful!